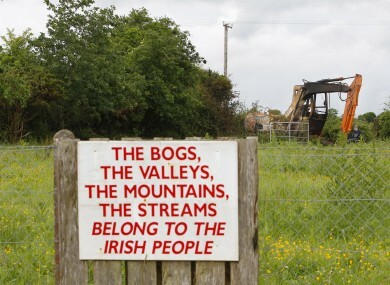 Sign erected by protesters at Clonmoylan Bog near Woodford, Co Galway. NEW LAWS HAVE been published which will allow people to cut turf in bogs which were previously protected under heritage laws. Natural Heritage Areas are special areas of conservation, usually designated to protect wildlife habitats in places such as raised bogs. Under the Wildlife (Amendment) Act, 2000, 75 raised bogs were deemed NHAs and as such turf cutting was due to cease on them. As well as this, a further 53 Raised Bog Special Areas of Conservation were designated under an EU Habitats Directive, which meant turf couldn’t be cut on them. However, turf cutters have long protested these designations, with heated demonstrations and negotiations taking place over the past number of years between turf cutters and former Heritage Minister Jimmy Deenihan. Now, Humphreys has moved to try to draw a line under an issue that dogged the previous government. The legislation published during the week will de-designate 39 raised bog NHAs and partially de-designate seven raised bog NHAs. The news laws are implementing the recommendations of a 2014 review of the raised bog NHA network, which was approved by Government. The review found that Ireland could more effectively conserve threatened raised bog habitats through focused protection and restoration of a reconfigured network. “I recently announced my intention to bring forward this legislation, which is an important step forward in terms of securing a long term resolution for turf cutters, while also ensuring that Ireland meets its obligations under the Habitats Directive,” said Humphreys. The reconfiguration of the network will have many environmental benefits and will result in a greater area of protected bog habitat being safeguarded than under the current network. The counteract the impact of de-designating the NHAs, Humphreys said that 25 bogs in public ownership or where there is reduced turf cutting pressure will be designated as protected habitats. Humphreys said that this will result in 2,500 fewer actively cut turf plots than there is now. Independent TD for Roscommon Michael Fitzmaurice – a vocal advocate for turf cutters – welcomed the announcement by Humphries, saying it was a ”step in the right direction” but that more needed to be done. “The legislation was announced two years by the last government but they never published it,” he told TheJournal.ie. “Basically we ended up waiting on that legislation to come through. I got it put into the Programme for Government was that it has to be published in the first 100 days of the new government. Fitzmaurice said that it solved “only part” of the problem and that other NHAs and Special Areas of Conservation needed to be looked at and re-designated. “Turf cutters welcome this being published but there are other issues that need to be resolved,” he said. We are making progress but there is lots more to be done. Email “Good news for turf cutters: New laws will allow them to work on protected bogs”. Feedback on “Good news for turf cutters: New laws will allow them to work on protected bogs”.